The killing of Shaka Blair, and the killing by a single gunman of Sgt. Harry Kooseram are crimes of equal order, deserving equal condemnation and police attention. The Hon. Attorney General publicly stated that court processes rather than verbal attacks, should be used by persons dissatisfied with acts of the police. Other things, like disorder or distrubances, seem to demand another process. I had begun writing a sermon on the current situation. I shall share it in summary with readers now, but the public crossfire of versions of Monday's events has advised against publishing the full sermon now . In it I was going to preach at the two major parties of this country. I was hoping to be fair to them. I was hoping to explain that each of them might be under pressure from forces outside of them, yet in their separate orbits. (After writing that, I read the PNC/R's statement separating itself from any provocations which took place at the funeral of Shaka Blair. At the time of writing, the PPP has not separated itself from the police version of the April 6 shooting which it so readily embraced, although reports from the autopsy hold up that version to question. ) After taking pains to read, and to listen to what various leaders have said after Monday, April 15, all I now want to say is this. SN ( April 21 and April 30, 2001) is my witness. In 2001 after the April 9 disturbances in the city , the WPA called for a public enquiry to avoid the chance of each party developing its own history of the events without any attempt at a 'public' history. I meant a serious attempt which, well organised and given the fitting resources, could help the general society. In 2001 the PNC/R next called formally for an enquiry. Some days later President Jagdeo supported the idea of a public enquiry. ROAR made a call for an enquiry, proposing a wider scope. Now we have another April. I was at Shaka Blair's funeral, arriving late from the city, and taking my stand in the throng outside of the Church. The building was already packed and overflowing. From there I moved to the burial site. When I read Brigadier Atherly's glowing approval of the law enforcement strategy applied, I said to myself, "Here an enquiry can have a leading witness." An army must have many eyes and many positions at the same time. 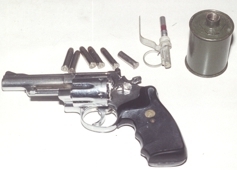 Gun belonging to Shaka Blair. The Brigadier's statement, until tested, will be helpful to the police. I defy any civilian, standing in the midst of the unfortunate events on the public road, to describe the responses of persons within the church when the firing started. Similarly, no civilian in the church or in the overflow congregation could be witness to what took place at the primary point of explosion, the public Road near Vigilance. I could not even see inside the church. Because of this, I have declined the request of two journalists, one senior and one young, to comment "briefly" on the events. Many words will not help either. We need a Commission of Enquiry and without delay. Such an enquiry will need external support, with domestic cultural advice. Section 19:03 empowers the President to appoint a Commission of Enquiry, which can summon witnesses. He should consult the Opposition Leader on the Commissioner or Commissioners who should be persons neutral in our domestic politics. Such a Commission can have a healthy effect on the population. It can examine the statements of persons officially involved, politically involved, or involved as onlookers. It can summon suspects and require them to explain their movements. Interests can be represented by counsel. Why do they seem to "fear the open word" spoken on oath and subject to cross- examination? Last year May I broke publicly with what appeared to the dominant sentiment in Buxton in regard to persons seen to be PPP supporters passing through Buxton-Friendship and other East Coast villages. Since then, I have formally withdrawn myself from their political discussions with its dominant view of race relations, which comes into everything. This morning those sentiments were deliberately provoked, in the name of the Guyana Police Force, by the unit known as "The Black Clothes." Just ahead of 1 AM six members of this unit kicked down the door of Shaka Blair's home, Middle Walk, Buxton, separated his wife and their two children from him and shot him. They then removed Blair from the home, according to reports, dragged him part of the way and left in their vehicle. Shaka Blair had been tried, found guilty and executed in a few minutes. This incident took place during the stay of the majority of delegates to the CARICOM-UK Forum in Georgetown. There must be authorities who are aware of the actions and movements of this unit. I call on them to reveal their names of members of the squad to the DPP and the Police Complaints Authority, and to any Commissioner appointed to investigate. The issue is explosive and demands immediate attention. Shaka was in fact on $10,000 bail arising out of a fight between him and a brother. This was the pattern of his recent problems with the police. I respectfully advise those in control of the security of the nation that this is a deliberate and self-serving provocation by that unit of the police force. The unit has been caught red handed. It acted without excuse, or predisposing incident. I was able to visit the violated home before leaving for the city today and to speak to Blair's spouse and relatives. My investigation will continue, although there is little mystery in this incident. The claim that Shaka was armed is a clumsy fiction not to be entertained. The notion that Blair was involved in a robbery on Easter Monday is very likely false, but even that is no excuse. Blair was not in hiding. To identify him in his absence by photograph may be good television, but poor justice. Trained police normally use an ID parade. After a number of offences in his earlier life, he married and settled down to small business activity of his own choosing. This probably involved some "hustle". To label him as a gun toter is unfair and libellous. The government TV is disgracing itself. No stone will be left unturned to expose it. I declare that the act of the Black Clothes in this particular matter is entirely without justification and is a human rights crime of the gravest nature. I appeal to those activists who previously provoked atrocities in Buxton to be careful what advice they give to their supporters. It is noteworthy that GTV told the public that there were two other occupants of the home, without identifying them as wife and child. Viewers made various guesses who these "occupants" were. There is another aspect of this matter, which should be made known. Shaka's wife is an Indian Guyanese. For what it is worth, so was Bryan King's wife. The police also fatally shot King some months ago. GTV, the government's TV station, was simply 'Black Clothes TV' on this issue. reported without a visit to the scene, and without having anyone there. It also claimed that the police removed a gun and a hand grenade from the home. The man's wife denies that he ever had a weapon in the house, much more a hand grenade. The police did not search the house and removed only the weapons they took into the house. The people of Buxton are of the impression that the action of the Black Clothes is a deliberate attempt to provoke the youth of the village and start disturbances. The government stands idly by and does not prevent these squads from taking lives. When the angry youth, with unwise, but flashy leadership, hit back, they regrettably hit back against the government's defenceless supporters, who have not offended. These attacks then become a second round of human rights violations but the government does not seem to care. The attacks, politically, only help to close the ranks of PNC supporters. In the 2001 experience, the PPP tried to buy out the anger with about $15 million and paid compensation to its battered supporters. I appeal to the Regional and Commonwealth communities not to be fooled by the police version of this dreadful wastage of life. Let a single Commissioner be appointed without delay to investigate, with human rights observers present, this single incident, which can present few complications.